You are here: Home / Contests / #Win Family Trip to New York or San Diego! #Win Family Trip to New York or San Diego! This is a sponsored post written by me on behalf of Atlantic Luggage for IZEA. All opinions are 100% mine. I started going to book conventions this year and it was so fun we decided that the family needed to start taking more trips. Our kids aren’t going to remember toys and “things” from childhood. They will remember the memories we create with them. We decided to do something different for Christmas this year. We are heading to the Florida Keys and going to go across Alligator alley. I want to stop off at the Skunk Ape museum and we are going to surprise the girls and go to Busch Gardens.Well mama needs some new luggage and Atlantic Luggage has been pioneering great luggage since 1919, making family traveling easier with their versatile, lightweight and affordable luxury sets. You can fit so much into each piece, ridding you of the hassle of multiple pieces of luggage to carry or to worry about in the airport. Atlantic Luggage has innovative features such as the Link2Go™ system, which allows you to connect multiple pieces of luggage for easy one handed rolling. Or, their 360-degree 4-Wheel Spinners allows for easy guiding and steering through busy terminals. 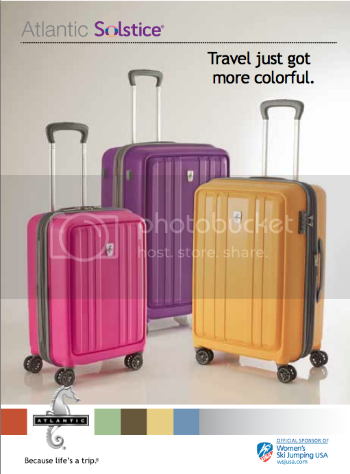 Atlantic Luggage has thought of it all, taking the struggle out of traveling for the whole family. Currently, Atlantic Luggage is running an amazing sweepstakes where you have the opportunity to win a family trip for four to your choice of New York or San Diego! Because life is a trip®, Atlantic Luggage is sending you on the trip of a lifetime! So, register for your chance to win a trip for the whole family today! Go to the included link and fill out the sweepstakes form. Winner will be chosen within 7-10 days following the close of the sweepstakes. Grand Prize trip must be booked by 9/30/15 and travel must be completed by 10/31/15. Win a family trip for four to New York or San Diego, courtesy of Atlantic Luggage and Delta Vacations! Grand Prize package trip certificate is valid for: (a) round-trip economy air transportation valued at up to $450 per ticket for the Grand Prize winner and three (3) guests from a major U.S. airport serviced by Delta Air Lines near to the Grand Prize winner’s home (as determined by Sponsor), to a major U.S. airport serviced by Delta Air Lines near New York City or San Diego, CA (as chosen by winner and determined by Sponsor); (b) hotel accommodations at a participating Delta Vacations hotel in New York City or San Diego, C; (c) four (4) Atlantic® carry-on sized suitcases; and (d) $300 allowance to spend on their choice of Delta Vacations Tour or Activity packages.